In the last weeks I have been very busy working on a new study, and I can now state that I have probably discovered a new Law of the Market. Thanks to this important Law, I want to share with you a few dates that should be very significant in the S&P500, during the 2019. Over the year, we see together how these dates will work out. I am very exited about it; we do not have to expect to see just change in trends during these dates. They should be expression of energy, creating energy that can create inversion, or strong acceleration to new trends. We will see. 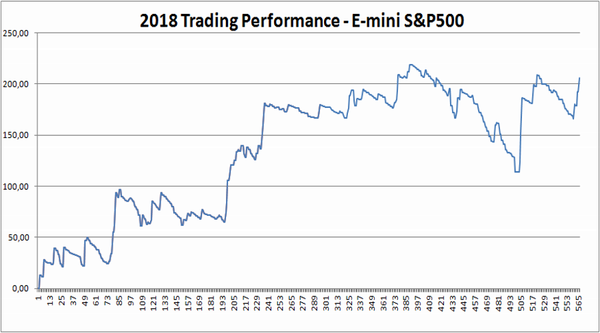 Here is our S&P500 2018 Trading Performance, which is the result of following the precise strategy we provide in the Daily Report Service. 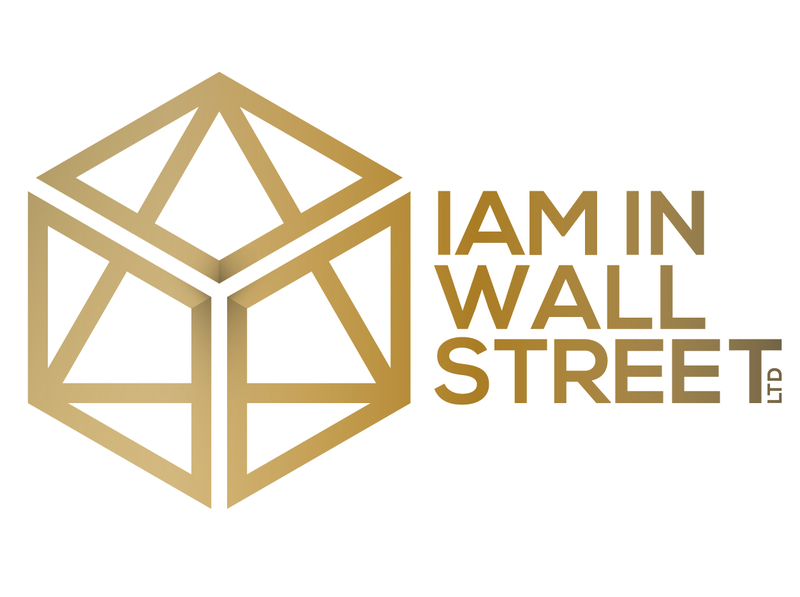 Despite the hard times of the last weeks of the year, we did a great job; consider that the strategy is in profit of about 200 points, while the S&P500 Index closed the 2018 with about 180 points down. 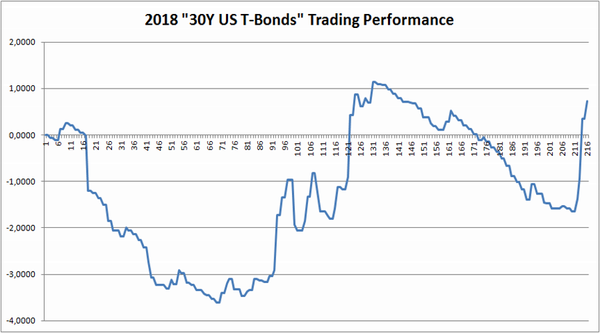 Our 2018 strategy with T-Bonds Futures did not produce a great performance. I cannot hide it just because the return was not good! 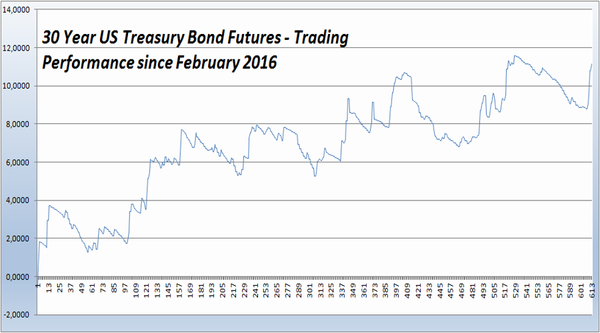 Reason: we were mainly trading with LONG positions, but T-Bonds were definitely in a downtrend. Soybeans Market is the King, as Gann used to call it. I believe Soybeans (and grains in general) are in a very boring pattern in the last times, and it is not easy to make profits with them. We used to make great profits, years ago, but times have evidently changed. When this Future was above 1000, everything was easier. Why am I telling this? Am I trying to justify the 2018 was a bad year for our strategy? Not at all! It could be better, yes, but our discipline did again a great work! 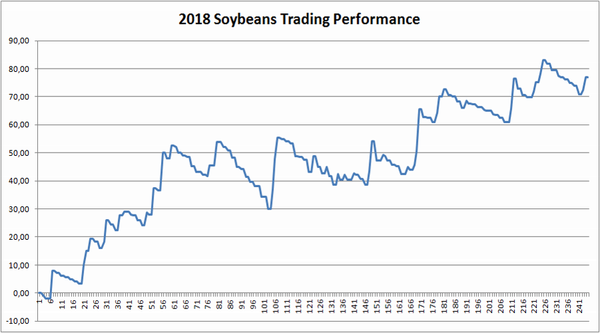 You can appreciate the uptrend of our Soybeans Futures trading performance. We love this Market, but I admit I loved it more a few years ago. 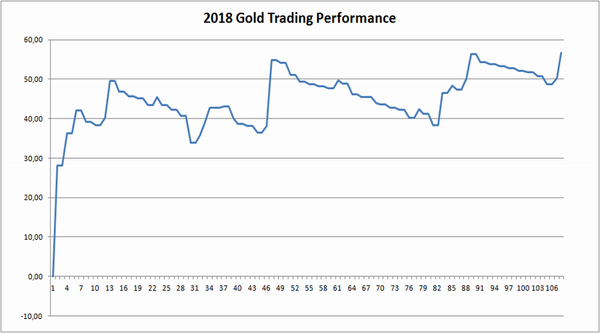 Anyway, we closed the year with a profit of 76 points per contract, while the January 2018 Futures Contract closed the year 100 points down!!! Ok, I do not make 200 points per year anymore, but I can say I am still satisfied. 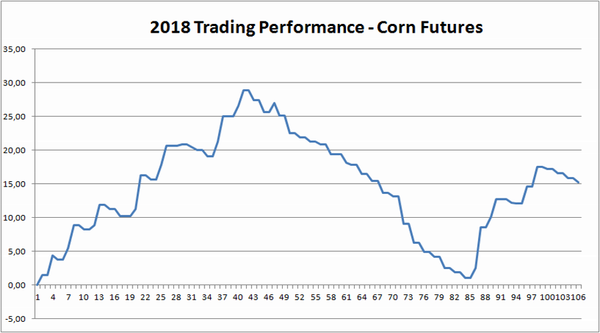 Corn closed the 2018 (March 2019 Futures Contract) with 18 points down, while we are in profit (even if a little profit). 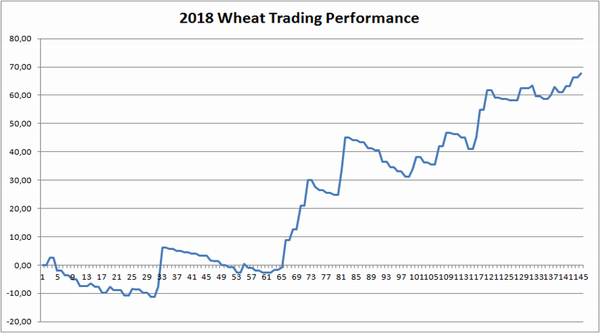 Using the 2019 March Contract, we see that Wheat had a positive performance during 2018, with a gain of 22 points per contract. However, we have a profit of 68 points. Not bad, isn’t it? 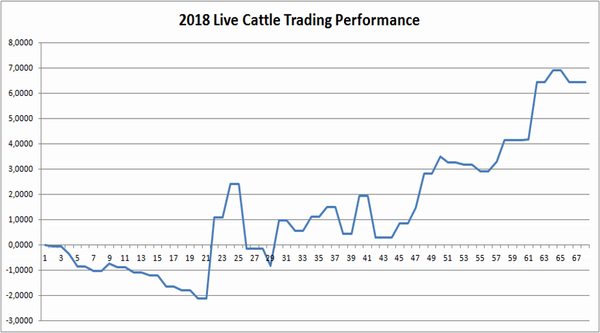 We had a performance of +6.5 points per contract, in line with the gain that Live Cattle produced during the 2018. Our Daily & Weekly Report Services have still some seats available. These seats are waiting for you. 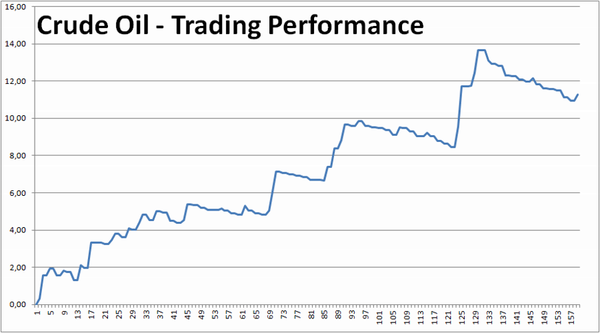 We share honestly our Trading Performance, no lies here, otherwise I would have shown better results with Corn or with T-Bonds, do not you think? If you want to see a few examples of our Reports, you can download the PDF file of the Daily Reports and the Weekly Report (which is included in the Daily Report Service). We also provide several Annual Bulletins. You can download the original 2018 Bulletins and Updates, so you can judge by yourself our work. The Updates are VERY IMPORTANT! With the Updates we create the strategy to follow the forecast! Any question you have, feel free to contact me!